In addition to exterior book drops placed at all Augusta County Library locations, the library has book drops in Verona and Weyers Cave. Items are picked up on a weekly basis from Verona and Weyers Cave. Items returned to these book drops are backdated during check in to the last pick-up date, ensuring that you will not be overcharged for late fees. The book drop is located in the northeast corner of the Government Center complex. 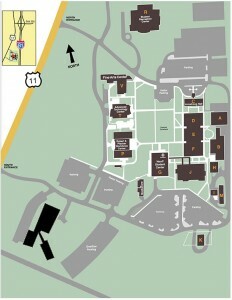 See the map below for the Government Center’s location. Items may be returned at Houff Library (located inside the Houff Student Center) or at their exterior book drop. See the maps below.